The corner of Vestry and Washington on the far edge of Tribeca has been through some big changes since we posted a little not-so-welcome sign back in the winter of '07. 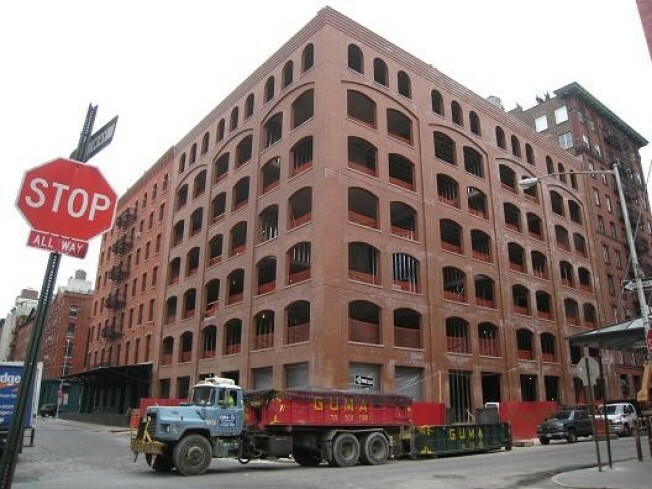 One welcome change was the cancellation of the contracts called in on the crew of developers who showed up a couple of years back with some big condo plans, both for this former parking lot at 415 Washington / 55 Vestry and its fancy little twin across the street at 414 Washington. Now, architect Karl Fischer has taken the helm at 415 Washington and all is quiet on these cobbled streets, save for the din of construction as buildings go up on every available corner and underbuilt block. These 9-stories, newly constructed from the ground up, have been dubbed the Fairchild and Foster Atelier, a darned fancy name in memory of a company of chemists who, by digging into the lining of pigs stomachs, produced digestive enzymes and other anti-dyspeptics at their manufacturing plant here. Foster died on site back in 1938 and some time after that the 415-423 Washington Street building went up in flames. Bad luck then led to bad luck later: the new 21-unit development has had more than its share of design and zoning snags, but now it seems the negatives are all in the past. No news yet on sales or marketing, but the red bricks are up and the big windows are in. With some luck the completion date could be right around the corner.